ENGLEWOOD CLIFFS, NJ (April 5, 2017) – Now in its 60th anniversary year, Dove is launching Baby Dove, a baby care range of products that brings the heart of the Dove brand into baby care. Baby Dove baby care products go beyond mildness to help replenish essential moisture and nutrients in baby’s skin. Dove has built on its 60-year heritage of moisture, mildness and care to develop cleansers enriched with our iconic ¼ moisturizing cream and DEFI technology to protect the skin’s natural barrier. 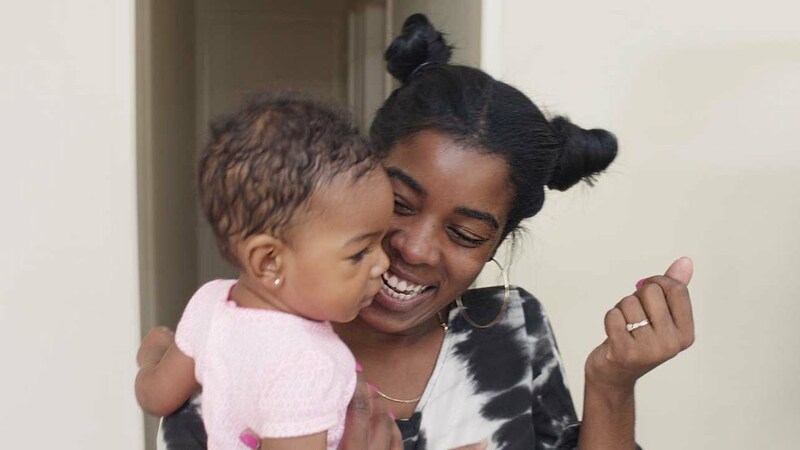 The Dove brand has long supported women in widening the definition of beauty – with the launch of Baby Dove, the brand is working to broaden how society defines parenthood. Baby Dove puts a stake in the ground that there is no one right way to be a parent and encourages all moms and dads to do what they think is best for their babies and themselves. As part of the Baby Dove US launch, the first new US category for Dove since Dove Men+Care launched in 2010, the brand is kicking off a campaign rooted in global and US research about new moms that challenges the ‘perfect mom’ stereotype and features real parents to broaden our view of what parenting looks like today. New research shows that new moms feel pressure to fit into a ‘perfect mom’ ideal, creating anxiety for them as they figure out their roles as parents. 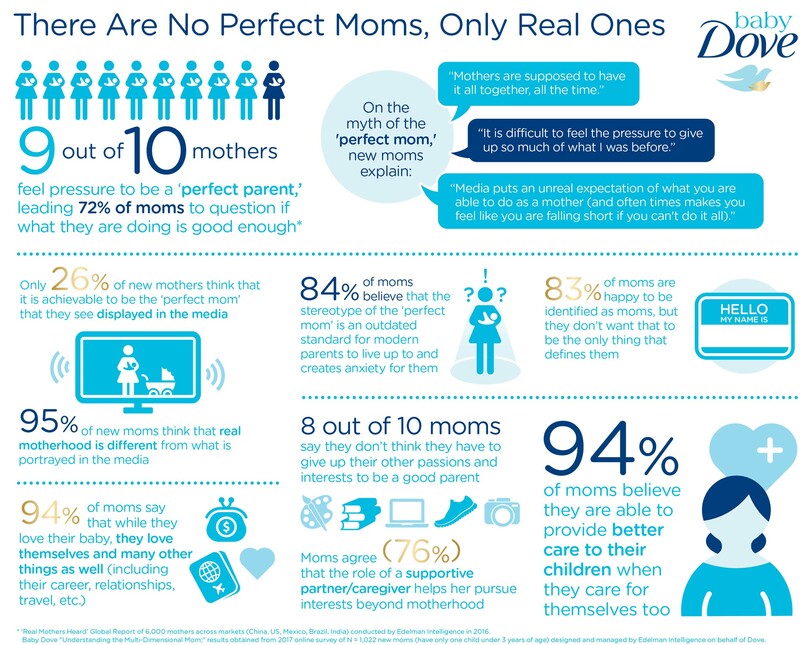 In fact, 89% of mothers feel pressure to be perfect, leading 72% to question whether what they are doing is good enough1. That’s because there’s a disconnect between how real moms are living their lives today and the limiting stereotypes of one-dimensional motherhood that are portrayed in film, advertising, media and pop culture. 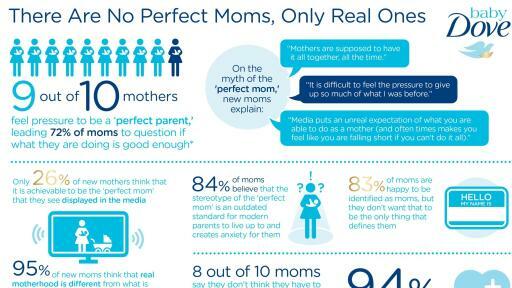 Eighty-four percent of new moms agree that the stereotype of the ‘perfect mom’ who always puts herself second and has everything together is an outdated standard for modern parents to live up to2. Similarly, Dove Men+Care research has shown that dads feel they are stereotypically portrayed in TV and advertising and their role as caregiver is not acknowledged. To break down the stereotypes and anxieties new parents experience, Baby Dove is releasing two videos featuring real moms and dads as a way to encourage all parents to trust their way. The results of the global research study ‘Real Mothers Heard’, covering six countries around the world, show that 9 out of 10 of mothers feel pressure to be a perfect parent, causing them to question whether what they are doing is good enough1. Further, Baby Dove conducted a US study, ‘Understanding the Multi-Dimensional Mom,’2 which revealed what is causing that pressure and why it is out of step with real mothers today. To help build the confidence of new parents, Baby Dove is releasing two videos depicting a broad, inclusive portrait of modern parenthood that challenges stereotypes that do not reflect the reality of parents today. The Baby Dove #RealMoms film will break down the one-dimensional stereotypes moms face and celebrate modern motherhood by featuring real parents and their many layers in an effort to broaden our collective view of what motherhood looks like. A second film will feature real dads in a celebration of their role as caregivers. Each will empower parents everywhere to trust their way when it comes to taking care of themselves and their babies. Baby Dove is a new range of baby care products that goes beyond mildness to help replenish essential moisture and nutrients in baby’s skin. While there is no one right way to parent, there is a superior way to care for baby’s skin. During a single bath, baby’s skin can lose moisture up to five times faster than an adult’s, making it vulnerable to dryness. All Baby Dove products are dermatologist and pediatrician tested and hypoallergenic for all babies’ skin types. 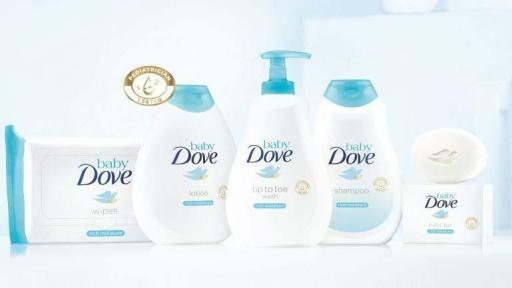 NEW Baby Dove has products for all skin types in its Rich Moisture and Sensitive Moisture ranges. Baby Dove’s Rich Moisture range has been developed for babies with normal to dry skin and goes beyond mildness to help replenish essential nutrients to help skin retain its natural moisture. The range is hypoallergenic with pH neutral, tear-free cleansers, and a fragrance specifically developed for delicate baby skin. Baby Dove’s Sensitive Moisture range has been developed for babies with sensitive skin. It is fragrance free for sensitive skin and the range is hypoallergenic with pH neutral, tear-free cleansers. Baby Dove is now available at food, drug, mass, value, baby, and online retailers. 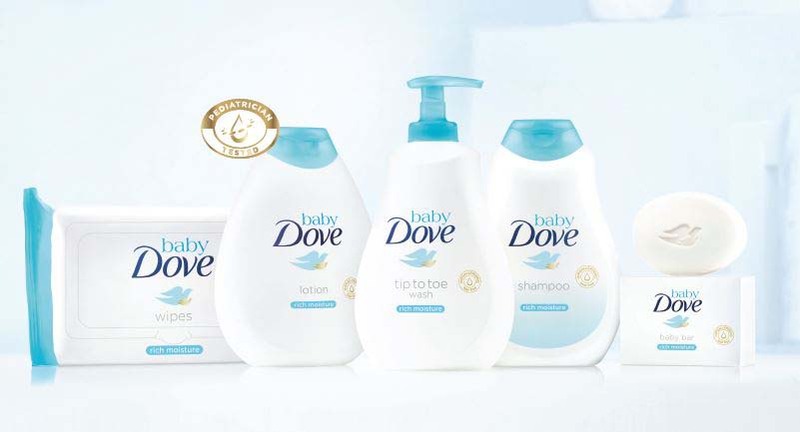 Visit Dove.com to find out more about Baby Dove products. Baby Dove encourages all parents to trust their way. There are no perfect parents, only real ones. Watch the Baby Dove videos at Youtube.com/Dove and share your experiences of parenting your way using #RealMoms and @BabyDoveUS on Facebook and Instagram. Unilever is one of the world’s leading suppliers of Food, Home Care, Personal Care and Refreshment products with sales in more than 190 countries and reaching 2.5 billion consumers a day. In the United States, the portfolio includes brand icons such as Axe, Ben & Jerry’s, Breyers, Caress, Clear Scalp & Hair Therapy, Country Crock, Degree, Dollar Shave Club, Dove, Good Humor, Hellmann’s, I Can’t Believe It’s Not Butter!, Klondike, Knorr, Lever 2000, Lipton, Magnum, Nexxus, Noxzema, Pond’s, Popsicle, Promise, Q-tips, Seventh Generation, Simple, St. Ives, Suave, Talenti Gelato & Sorbetto, TIGI, TONI&GUY, TRESemmé and Vaseline. All of the preceding brand names are trademarks or registered trademarks of the Unilever Group of Companies. Unilever employs approximately 8,000 people in the United States – generating more than $9 billion in sales in 2016.